She gave birth to her second daughter with Robin Thicke less than a month ago. Now April Love Geary is letting followers into her life with a new baby, three-week-old Lola. The 24-year-old model shared Instagram photos on Saturday of herself and her 42-year-old fiancé spending some quality time with their young children while she breastfed. In the sweet family picture, April reclines on the white sofa with a gorgeous smile while Lola latches on. She had a pair of comfy black pants on and had her dark locks pulled back in a bun. The Blurred Lines singer lies off the side, his head by his future wife's shoulder as he stares into the baby's eyes. One-year-old Mia seems to be ignoring everyone else as she grasps her mother's phone and stares at some pictures. 'You found the light in me that I couldn’t find ', she wrote, copying a set of lyrics from Always Remember Us This Way, one of Lady Gaga's songs from 2018's A Star Is Born. In an earlier picture, the Sports Illustrated Swimsuit Issue model was seen from the side while feeding Lola. 'My babies,' she wrote, followed by a crying emoji. Despite all the stresses that come with birthing and raising a new child, the couple were spotted out earlier this month having some precious alone time and looking as in love as ever. April posted a humorous meme to her Instagram Stories, seemingly referencing the way Robin has helped to take care of her. 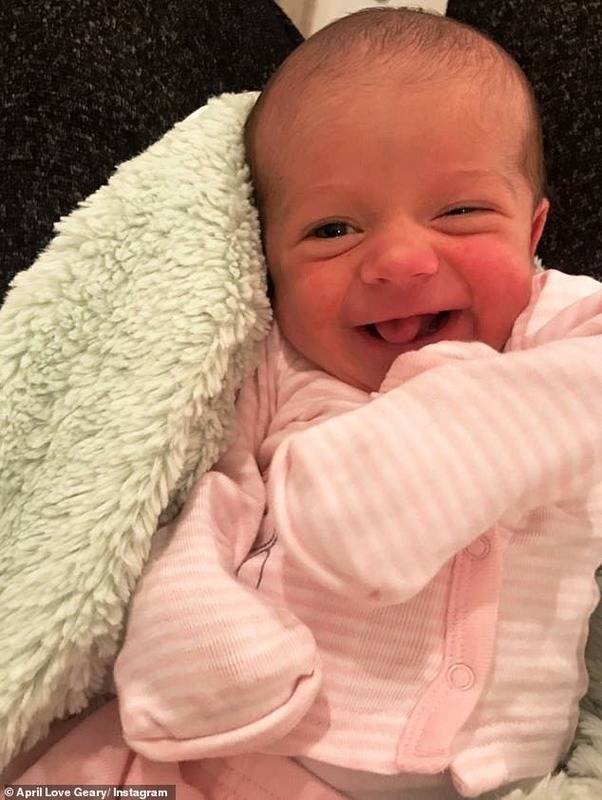 Considering that she's the new beneficiary of an incredibly cute baby, the long-legged beauty couldn't help but post a few pictures of Lola showing off her smile. The pink-clad tot even looked to be laughing or sticking her tongue out in one of the adorable photos. In addition to Lola and Mia, Robin shares an eight-year-old son, Julia, with his ex-wife Paula Patton. He and April first made their relationship public in May 2015, shortly after finalizing his divorce with Mission: Impossible — Ghost Protocol actress. They had previously been married since 2005, though they dated each other since they were teenagers. After years of dating and the birth of their first child, the Masked Singer star proposed to a pregnant April during their Christmas festivities.